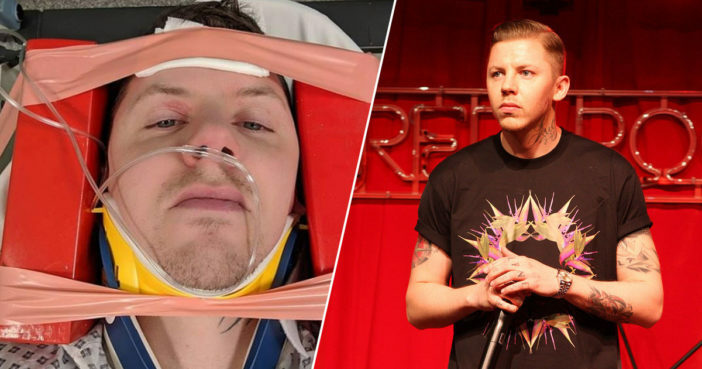 Professor Green has been forced to cancel his UK tour after suffering a neck fracture. The Never Be a Right Time rapper, whose real name is Stephen Manderson, fractured a vertebrate after a fall during a seizure. Pro Green, who is originally from Hackney, had been packing for his UK tour at the time of the seizure, mere hours before his first gig at Cardiff’s Globe venue. Green had been due to perform sell out sets at stadiums in Birmingham, Glasgow, Newcastle, Manchester, Leeds, Sheffield before finishing up at Brighton’s The Haunt. Gig goers will reportedly now be given refunds, with Green promising he will embark on a ‘bigger’ tour during the winter months. Taking to Instagram, Green shared three pictures of himself lying on a stretcher. Here, he can be seen wearing a neck brace with a tube inserted into his nose. I had seizure this morning which resulted in a fall while I was packing for tour. Depending on how you look at this fall I was extremely lucky. I fractured vertebrae in my neck and subsequently had to cancel my tour that was due to start today. I’ll be back in the winter with a bigger tour. I’ve had two further seizures and am lucky I didn’t break my neck. Really f*cking lucky. Thanks for baring with me most importantly thank you to our NHS, heroes amongst men (and women). Meanwhile, concerned fans have been sending messages of support to Green, wishing him all the best as he begins his recovery. Rest up you’ll be back soon enough health comes first. You poor thing, always positive, please get well and take all the time you need, lots of love. UNILAD wishes Professor Green a full and speedy recovery.